Policy | Forging connections between neuroscience, cognition and the wider world. We have recently started a new project focused around children that are considered to be “at risk” of poor educational attainment due to their socioeconomic status. Indexes of socioeconomic status include complex measures of interrelated components, with one key component being family income. As a result, socioeconomic status gives an index of poverty that incorporates other forms of deprivation. There is, at present, an increasing effort to provide better links between research on socioeconomic status, its impact on cognition, and government policy. However, when considering educational attainment, there is still little being done to support children from a lower socioeconomic background. The recently released State of the Nation Report  indicates the need for further research into this area. It calls for increased interest and action in order to help close the performance gap between children from different socioeconomic backgrounds and reduce the effects of poverty on children. The State of the Nation Report calls for the UK government to re-think their existing approach to child poverty if they wish to achieve the targets set out in the “2020 challenge” to “reduce child poverty by half and prevent Britain becoming a permanently divided society.” The knock-on implications of poverty on educational attainment are well noted in the scientific literature. In 2013, 38.5% of children receiving free school meals, which is a commonly used indicator for poverty, achieved an A*- C grade in Maths and English, compared to 65.3% of children not receiving free school meals. In addition, research published by the Social Mobility and Child Poverty Commission has shown that children from deprived backgrounds that are considered to be high achieving aged 7 fall behind children from the most affluent backgrounds that were considered to be low achieving at the age of 7. 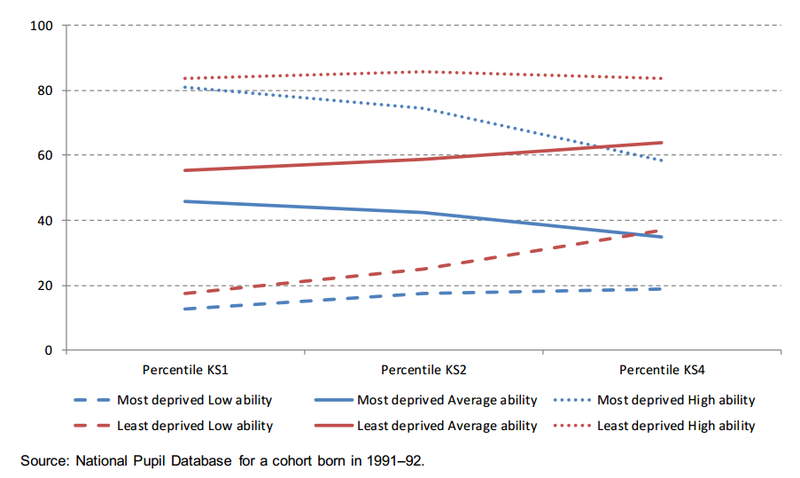 This crossing over in attainment levels is seen by 14-16 years of age (see Figure 1) . This pattern of crossing over indicates that the environmental components of socioeconomic status have an impact on a child’s potential for academic attainment above and beyond genetic influences. Since 2005, the attainment gap in education between children from a low socioeconomic background and children from a high socioeconomic background has only closed by 1.6%. The implication is that those children with a low level of educational attainment are 4 times more likely to remain in poverty. With all this considered, further research is needed to provide a clearer picture of how socioeconomic status influences cognition and education. A key focus of this should involve identification of the factors within socioeconomic status and cognition that mark children as being more susceptible to the risk of poor educational attainment. 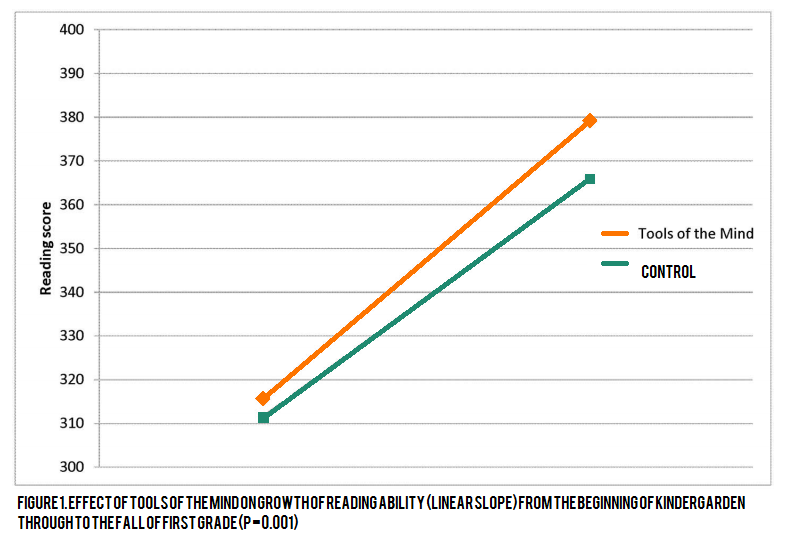 In turn, greater resources need to be devoted to identifying the most effective interventions. These studies are difficult and complicated to conduct, but as The State of the Nation Report identifies, improving the educational prospects of children growing up in poverty provides one of the best mechanisms for creating a more equal society. In conclusion, although the issues surrounding the socioeconomic impact on education have in part been researched and evaluated, there is yet to be a thorough exploration of all the factors involved. Further investigation is needed to identify which cognitive, neural and environmental measures provide the most prominent markers of risk and resilience for children growing up in poverty. Research along these lines is sorely needed if government policy is to target those most in need of support.